A quiet Sunday stroll took a shocking turn at the weekend after a swan was attacked by a dog in Ellon. 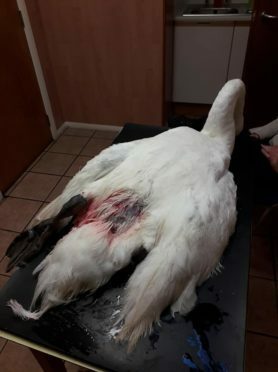 A number of walkers were witness to the attack at around 5.15pm when a golden brown dog, thought to be a labrador or retriever, left the swan with life-threatening injuries on the banks of the river Ythan. The owners, a man and a woman believed to be in their 50s, left the scene without attending to the stricken bird. The dog is thought to be called Alfie, after witnesses heard its owners calling it by that name. 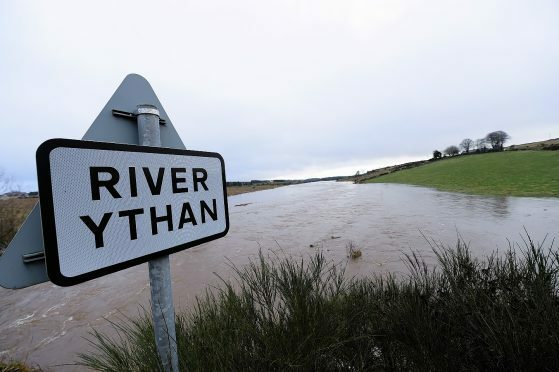 It had been swimming in the Ythan below the two bridges in the town centre. One witness, local resident Audrey Douglas called the Glen Ythan veterinary centre in Methlick. She said: “It was horrific to watch. Unfortunately, the dog had no recall and the owners just watched it happen. The centre in turn alerted the New Arc animal rescue centre in Ellon, where the swan is now being treated for its injuries. New Arc owner Keith Marley said: “The injuries are life-threatening. It’s in a bad way with a very damaged leg. He added: “I don’t blame the dog, I blame the owner. I think it’s irresponsible of the owner to just walk away. “On a public footpath, dog-owners have a responsibility to either keep their dog on a leash or have it well-trained. Swans are a protected species under the 1981 Wildlife and Countryside Act. Police were last night unable to provide an investigation update. Hundreds of people registered their disgust on the New Arc’s Facebook page. Last year two swans were hit by a car in Ellon which drove away. One died but the New Arc was able to save the other.